Frank is a man with many passions and his life on this dimension was every bit as rich as his professional life. Frank didn’t have traditional hobbies (bridge, woodworking, gardening) but had a passion for his family, for food, for travel, and for music. Frank had an extraordinary wife, Emily, who he met through Emily’s brother John, a colleague on Harvard Law Review, and John’s wife Anita. 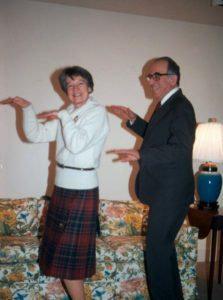 After a double date and some courtship, there was a secret engagement made in Vermont and on April 26, 1958 Emily Jones (27) and Frank E.A. Sander (30) married at Valley Forge Quaker meeting in Pennsylvania with Justice Frankfurter in attendance and Efram Zimbalist, Sr. playing violin. The wedding was scheduled so Frank could attend the Pablo Casals Festival in the Spring of 1958 (another love) and the honeymoon was in St. Johns. Frank was close to his parents and siblings although the migration from Germany turned traditional roles upside down with Frank called in to help his parents with English in the early years. Frank’s father Rudolf passed away in 1966 at the age of 85. 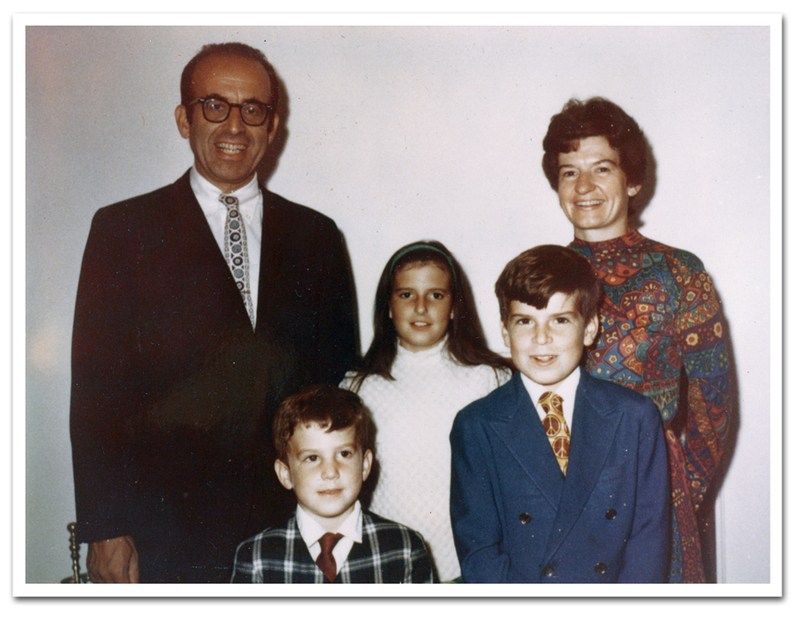 Frank’s mother lived until 1978 (age 88) and never ceased her love of cooking Sunday brunches for an endless array of grandchildren, family friends, and others lucky enough to find themselves at her apartment on Amory Street in Brookline. Like a circus car, her small refrigerator seems to produce endless yummy courses on a Sunday until all participants agreed they couldn’t eat another morsel. A key to understanding Frank was his passion for food. This was not a casual vocation or hobby. At home, he cooked delicious items like popovers, breads, and omelets. 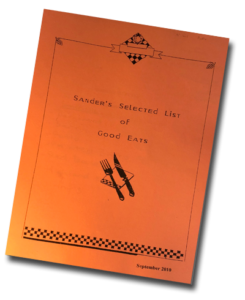 He regularly kept in his wallet an ongoing list of restaurants to try and published the very popular mimeographed “Sander’s Selected Guide to Good Eats” which got bigger over the years. Frank would never consider going to a country without trying its local food even when members of his family with weaker stomachs got sick or were intimidated. He made family lore when he found himself at a Osaka train station, buying, over the protestations of a vendor, and then tasting a small package he thought might be green candy but which turned out to be a concentrated seaweed salt cube used to season several gallons of rice. Frank took his food and meals seriously. 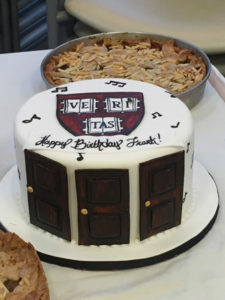 While Frank is known for serving as Associate Dean of HLS for a record 13 years, he is just as well known for starting a bread delivery club that sourced great bread from a Latvian Bakery on the South Side of Chicago which Frank delivered each week to the mailroom and discerning professors and staff. Travel was a passion with amazing sabbaticals every seven years that took Frank to distant lands and incredible food. Frank’s travels took him to, among other places, Sweden, Greece, New Zealand (1994), Australia (1994), Germany, United Kingdom, France, Italy, Switzerland, Austria Denmark, Finland, Japan (to advise on tax law in 1982), Canada (1981), Norway, Sweden, Spain (1994), Singapore, China (1980) with a group of mediators, and India. Frank also played an early role in developing the Salzburg Seminar and returned there on a number of occasions. In 1954 he travelled there and in 1975 our family went to Salzburg so Frank could give a four week course on American Law. Chief Justice Warren Burger gave a pre-lunch talk. In 1981 Frank was the faculty chair for the first conflict resolution session with the Salzburg Seminar. Frank remained an active member of the community, supporting many local causes which included a number of favorite music groups like the Haydn & Handel Society, Aston Magna Foundation, and other chamber music groups. For much of his life Frank was able to play the flute and would invite other chamber music players to his house to complete a trio or quartet. Frank celebrated his 90th birthday in Concord with a string quartet and more than sixty friends..
A real love for Frank was his family, starting with his amazing wife Emily, three children Alison, Tom and Ernie, their spouses Laura, Steve, and Leslie, four grandchildren Caleb, Anna, Emma and Lindsay, and an array of very impressive nieces and nephews. Frank remained actively involved in the lives of all family members, sending clippings on relevant articles, arranging for fabulous trips, trying out the latest restaurants, and seeking feedback and menus from restaurants he hadn’t yet tried but which he wanted to rate. It is a tribute to who Frank is and was that he not only created whole new fields of law and ways of teaching but that he was just as involved in attending to the concerns of employees in the mailroom, comparing restaurant lists with a neighbor on a plane, encouraging his wife Emily to start water color painting at the age of 60, scouting out musical talent, and working in his own way to make the world a much better place.